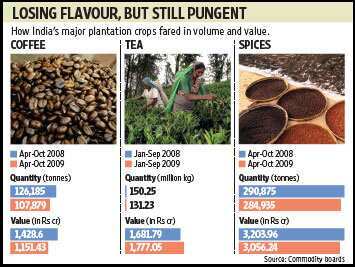 Kochi: Lower production levels on account of erratic weather patterns have driven down this year’s exports of plantation crops, primarily tea and coffee, while spice exports picked up in October due to lower production elsewhere in the world. Coffee exports have fallen 14.5% in volume and 19.36% in value between April and October from the year earlier, while tea dropped 12.66% in quantity between January and September, rising 5% in value on account of higher prices. Tea is the only plantation crop whose exports are calculated according to the calendar year. Spice exports started picking up from September and the deficit for the April-October period is just 2% by volume and 4.6% by value. Roshni Sen, deputy chairperson of the Tea Board of India, the government trade promotion body, said the non-availability of sufficient crops has prevented India from boosting exports. Still, Indian exporters have benefited as weather and production patterns have been similar across the world, with major tea-producing nations such as Kenya and Sri Lanka reporting lower crop output on account of drought conditions. Between January and September, the period for which figures are available, tea production fell to 696.72 million kg from 706.74 million kg in the year earlier. India exported 131.23 million kg, against 150.25 million kg last year. However, a hike in unit prices due to a supply crunch pushed up the cost of tea to Rs135.42 a kg from Rs111.93 a kg last year, with export earnings rising to Rs1,777.05 crore from Rs1,581.07 crore. Meanwhile, an import order from Iraq for 15 million kg of Indian and Sri Lankan teas last week met with a lukewarm response from Indian exporters due to concerns over payments. Deepak Shah, chairman of the South Indian Tea Exporters Association, said that though India had an advantage over Sri Lanka, where output has dropped and prices are higher, exporters were unwilling to take any risks. “There have been issues of delayed payments. The condition in the order that payment (will be made) after the consignment reaches Iraqi ports and is inspected, added to the risk since exporters would not be able to take any letters of credit and get any bank support," he said. If the terms are changed, exporters will try and satisfy as much of the contract as they can, Shah said. What has helped the tea trade is strong domestic consumption and better price realization—Indians drink almost 80% of the country’s average production of 850 million kg. Heavy rains interspersed with long dry spells since October and September have hit coffee output and exports, said G.V. Krishna Rau, chairman of the Coffee Board of India. Production for last year has been estimated at 262,000 tonnes, while the post-blossom estimate for the current year has been pegged at 306,000 tonnes. With plucking set to begin at the end of November and expectations of a better crop, Rau claims that the deficit will be wiped out before the end of fiscal 2010 and that exports should reach last year’s level of 197,000 tonnes. Spice exports have seen volumes climb since October. Only 284,935 tonnes worth Rs3,056.24 crore had been exported through October compared with 290,875 tonnes worth Rs3,203.96 crore during the corresponding period of last fiscal. According to data from the Spices Board India, October alone saw exports of 41,585 tonnes worth Rs505.74 crore, a 10% increase in volume and a 16% growth in value. Exporters say poor cardamom and chilli crops in Guatemala and China, respectively, have pushed Indian exports higher. Similarly, the lower production of seed spices such as cumin in Syria and Turkey, and coriander in Romania and Bulgaria, have given India an edge. T.T. Jose, managing director of Mas Enterprises Ltd, says that the demand from exporters at the weekly cardamom auction held at Vandanmedu in the hilly Idukki district has been good so far, especially since October, and is holding up.